Do you know what Bank of America's original name was? Bank of America (NYSE:BAC) is one of the most popular bank stocks in the market, and as one of the big four U.S. banks, millions of Americans know it well. However, here are some details about the bank's history and current operations that you might not be aware of. 1. Bank of America started as "Bank of Italy"
Bank of America's roots can be traced to 1904, when Amadeo Giannini founded Bank of Italy in San Francisco. Originally established to serve working-class citizens in the area, particularly Italian-Americans, the bank grew rapidly and became Bank of America in 1930. These facts about Bank of America might surprise you. Image source: Getty Images. 2. The acquisition of Merrill Lynch made Bank of America the world's largest wealth-management corporation. Thanks to the financial crisis-era acquisition of Merrill Lynch, Bank of America is the world's largest wealth-management corporation. It has the top U.S. wealth-management market share and the top share of personal trust assets and high-net-worth client assets. The global wealth and investment management division's total client balances are $2.6 trillion and continue to grow. With all of the disruptive payment technologies that have soared in popularity over the past few years, and with the rise of internet-only banks, it may come as a surprise that Bank of America has emerged as a leader in digital banking technology and the adoption of that technology. In 2016, Bank of America was named No. 1 in online banking and mobile banking functionality, and the bank also launched more than 8,500 cardless-enabled ATMs. Twenty percent of the bank's deposit transactions are mow made through the mobile platform, up from 16% just one year ago. Also, more than 22 million Bank of America customers now use the bank's mobile platform -- a 13% year-over-year growth rate. Bank of America's tremendous growth over the years hasn't been entirely organic. As with most other big banks, Bank of America's current size is a result of a combination of a series of mergers and acquisitions, especially over the past 25 years or so. Continental Illinois National Bank, acquired in 1994. FleetBoston Financial, acquired in 2004. U.S. Trust, acquired in 2006. LaSalle Bank, acquired in 2007. Countrywide Financial, acquired in 2008. Merrill Lynch, acquired in 2009. Moreover, Nations Bank acquired Bank of America in 1998 but kept the better-known Bank of America name. As of March 31, 2017, Bank of America has $635.6 billion in consumer banking deposits, giving it the No. 1 U.S. retail deposit market share. What's more, this figure is increasing rapidly. Over the past year alone, Bank of America's retail deposit base has grown by 10%. It may surprise you to know that Bank of America is one of the top mortgage producers in the United States. In fact, the bank holds the No. 2 market share for retail mortgage origination volume, and it's the No. 1 home equity lender in the country. 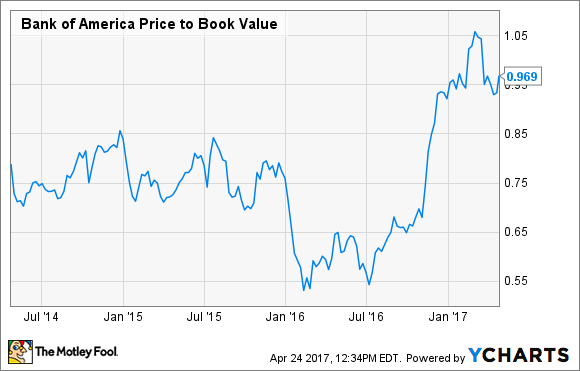 As of the end of the first quarter of 2017, Bank of America had a book value of $24.36 per share. That means the bank is trading for about 3.3% less than the value of its assets. While this isn't quite as impressive as the discounts of the past few years, it's still like buying $1.00 of assets for $0.97, and it makes Bank of America one of the "cheapest" bank stocks in the sector. Because of the low valuation of recent years, Bank of America has bought back millions of shares of its own stock. There have been times when shares traded for less than 55% of book value, so the bank decided that buybacks were by far the best way to increase shareholder value. In fact, since 2013, Bank of America has spent $12.4 billion on stock repurchases, including more than $5 billion in 2016 alone. I mentioned earlier that Bank of America trades for less than the value of its assets and has done so for quite some time. One major reason is that the bank hasn't been able to generate a level of profitability that banking investors like to see. Specifically, the industry benchmarks for profitability are a return on equity of 10% and a return on assets of 1%. While Bank of America is doing better than it has been in recent years, its metrics of 7.3% and 0.88%, respectively, still aren't thrilling to investors. One of the reasons Bank of America's stock price has roughly doubled since early 2016 is that interest rates have started to rise and are expected to keep doing so, especially now that Donald Trump is in the White House. In fact, net interest yield has started to rise, and the bank projects that a further 100-basis-point increase in rates could add $3.3 billion in net interest income over the next 12 months. That kind of change could easily catapult Bank of America's profitability to an "acceptable" level and could take the stock's valuation along with it.